Who says math can't be funny? In Math Jokes 4 Mathy Folks, Patrick Vennebush dispels the myth of the humorless mathematician. His quick wit comes through in this incredible compilation of jokes and stories. 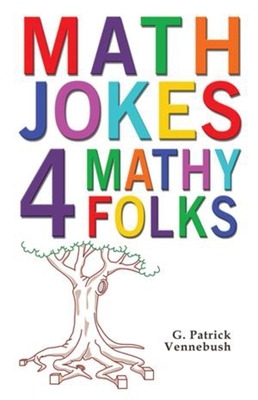 Intended for all math types, Math Jokes 4 Mathy Folks provides a comprehensive collection of math humor, containing over 400 jokes. It's a book that all teachers from elementary school through college should have in their library. But the humor isn't just for the classroom-it also appeals to engineers, statisticians, and other math professionals searching for some good, clean, numerical fun. From basic facts (Why is 6 afraid of 7?) to trigonometry (Mathematical puns are the first sine of dementia) and algebra (Graphing rational functions is a pain in the asymptote), no topic is safe. As Professor Jim Rubillo notes, Math Jokes 4 Math Folks is an absolute gem for anyone dedicated to seeing mathematical ideas through puns, double meanings, and blatant bad jokes. Such perspectives help to see concepts and ideas in different and creative ways. When not solving problems, telling jokes, or playing ultimage, G. Patrick Vennebush manages online projects for the National Council of Teachers of Mathematics. His master's degree from the University of Maryland is in curriculum and instruction. He lives in northern Virginia with his wife Nadine, his twin sons Alex and Eli, and his golden retriever, Remy.